STANDING ROCK SIOUX TERRITORY (Herald de Paris) — US Army veterans numbering in the hundreds have been filtering onto the snow-swept plains at the construction site of the Dakota Access Pipeline, intent on shielding the Native American protesters from the militarized police. At issue are historically sensitive native lands, the rights of Indian Nations, and for the traditional inhabitants of this land, sacred sites and the protection of their fresh water source. Since the beginning of the stand-off, others have joined the protest in numbers that swell daily. While it seems clear that all those opposing the US Army Corps of Engineers are in favor of the rights of the Standing Rock Sioux protecting their historical lands and their water, how we arrived at this point continues to be muddled by the fast-evolving human interest aspects of the story. Rather than to scratch the surface on this issue, we went all the way back to the beginning. Consulting with professional subject matter experts in cultural resources, archaeology, anthropology, and even environmental regulations, we have uncovered the core issues – issues key to ending this standoff before anyone gets killed. The location of the pipeline already moved once. the initial proposal was for the DAPL to cross North Dakota north of Bismark. When it was determined that more northern location of the pipeline posed a potential threat to the drinking water of the Bismark population, The Corps of Engineers relocated the proposed pipeline south of Bismark to its current location. While the Corps’ consultants returned a determination of potential threat for the northern route, they came back with a No Effect determination on the southerly route. This is the same pipeline carrying the same crude oil. It seems clear that where there was concern over the drinking water for the people of Bismark, there was no similar consideration given to the drinking water of the Native American population that lives south of Bismark. This seemingly discriminatory determination is the cornerstone of the entire standoff. Nine Native American Nations, the Cheyenne, Sioux, Arapaho, Crow, Assinboine, Mandan, Hidasta, and Arikara accepted this portion of their historical lands under the Treaty of Fort Laramie in 1851. However, to some Sioux tribes, such as the the Lakota Sioux, and the Dakota Sioux, tribes that had no interest in subscribing to the idea of land ownership, such a treaty was meaningless – they simply did not believe in land ownership. They continued on as they always had on their traditional tribal lands. The land in question today was clearly ceded to the Native American population by that 1851 treaty. In 1868, however, the US government tried to renegotiate the Treaty of Fort Laramie. That renegotiation required signature by a majority of the Native Nations, and would have suppressed the northern boundary of Indian Territory southward, to essentially the North Dakota/South Dakota state line. While the Standing Rock Nation signed the 1868 ratification, it did not garner a majority of tribal signatures, and was thus never consummated. The Standing Rock Sioux Reservation was greatly reduced through the Act of March 2, 1889, also known as the Dawes Act and the Allotment Act. 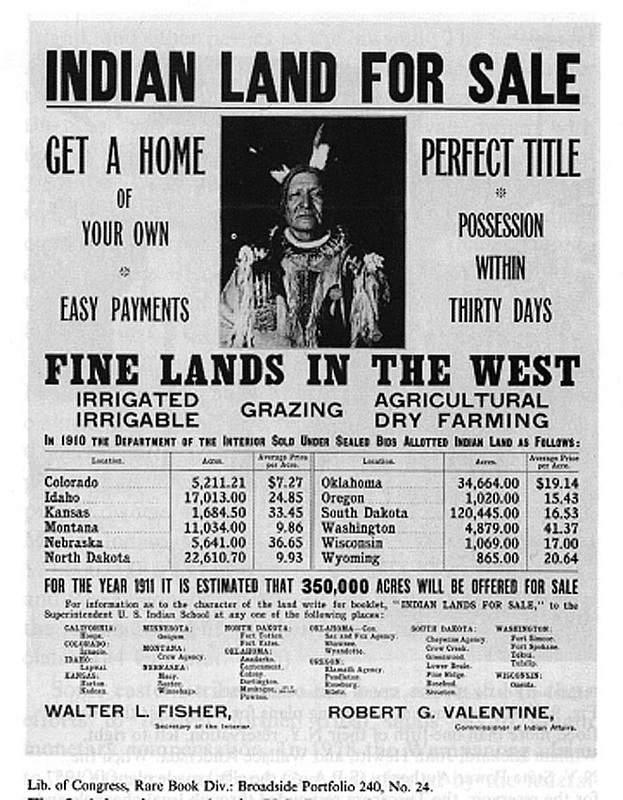 This opened up the reservations throughout the United States to settlement by non-Indian entities, thus creating checker-boarded land ownership within the Standing Rock Reservation. The tribe maintains jurisdiction on all reservation lands, including rights-of-way, waterways, and streams running through the reservation. SO WHO OWNS THE LAND? Thus, there is no argument over Army Corps of Engineers land vs. Sioux land. The Standing Rock Nation maintains jurisdiction over all reservation lands, as well as rights to waterways on the traditional reservation, and those waterways include the Missouri River in accordance with the Dawes Act. Since the National Historic Preservation Act also includes a provision for the Advisory Council on Historic Preservation to enter into agreements with Indian tribes to substitute a tribe’s historic preservation regulations for the Section 106 process, it seems that the Standing Rock tribe was not afforded their full rights. Under this arrangement, an Indian tribe has the ability to determine how federal agencies meet the requirements of Section 106 of the National Historic Preservation Act for projects on its lands. While documents do exist that state that the Standing Rock Sioux chose not to have input, our research team has uncovered audio recordings of meetings where the Standing Rock leaders specifically requested to have input into the determination process concerning the location of the Dakota Access Pipeline. For this current route of the pipeline south of Bismark, the US Environmental Protection Agency actually disagreed with the Corps’ No Effect determination. Why? Not only did the EPA believe the southerly route of the DAPL posed a potential threat to the environment south of Bismark, a spill in that location also posed a threat to potential cultural and historical resources in the region. The EPA recommendation was ignored. To date, it seems that the US Army Corps of Engineers are proceeding without proper input from the Standing Rock Sioux tribal leadership, and in defiance of EPA recommendations. Last Monday, North Dakota Governor Jack Dalrymple ordered a mandatory evacuation of protesters seeking to block construction at the Oceti Sakowin Camp, but both the state and the U.S. Army Corps of Engineers said they have no plans for “forcible removal” of the protesters. The Corps of Engineers earlier had said that it planned to close the camp, led by the Standing Rock Sioux tribe of North Dakota, by Dec. 5, and that anyone still there could be prosecuted for trespassing. However, neither the State of North Dakota nor the Corps of Engineers seem to have a legal justification to evacuate protesters or arrest them for trespassing as the Federal Government gave jurisdiction over this land to the Sioux in 1889. We continue to research all perspectives of this story in great depth. Stay tuned.